sock prØn. : i can has mittens? handspun merino/silk, ashland bay "rose"
What a fun, fast pattern. I knew when Anushka posted pics that it would be perfect for using little bits of lovely handspun-- mine finished with ribbon weighed in at 42 gm (and I still have leftovers... there's a compulsion in me to squeeze to the last drop when it comes to something good and special like yarn I've spun myself). ...but it's not noticeable from the business side. Meanwhile, back on the farm-- I worked the slipped st cable rib a little differently than written; I slipped as if to purl, knit next st, replaced slipped st to LH needle and knit into the back of its loop. 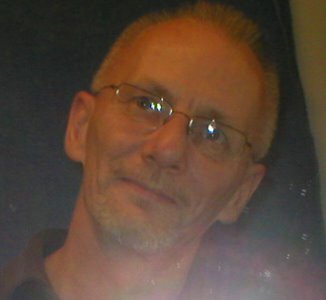 Again, this was just a change b/c it's what I was used to doing. Finally for the on-purpose portion of our program, I knit the hand 2 repeats longer than written (and waited to start the palm ribbing to match)-- my row gauge was on, but the column gauge wasn't. No big deal, even with the added length and extra yarn used for the picot cast on, I had plenty of yarn. Your book appears to be in Latvian, but the title is in Russian. 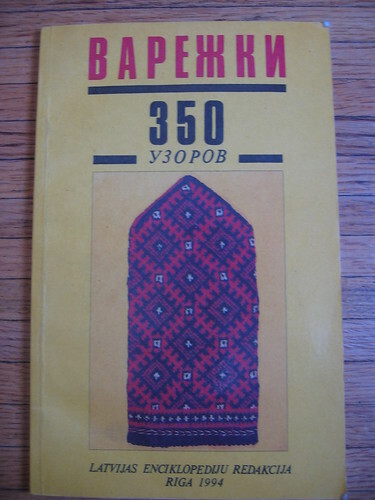 Варежки (pronounced var'ezhki) is Russian for "mittens" and узор (printed as узоров because it is associated with the number 350) is "pattern." This was another serendipitous find, I was googling for Upitis' Latvian Mittens (high on my elann mitten score) and stumbled upon this one. 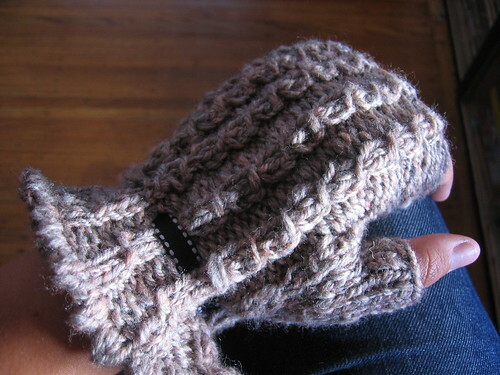 It reminds me a lot of the online Latvian mitten collection here (and gloves here). Both are slow loading pages, but lovely. 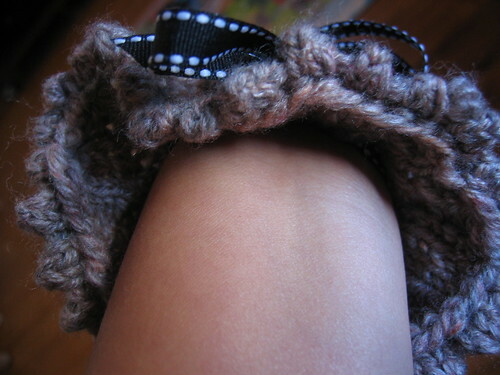 The source page has socks and other stranded knitting pics linked from it, as well. 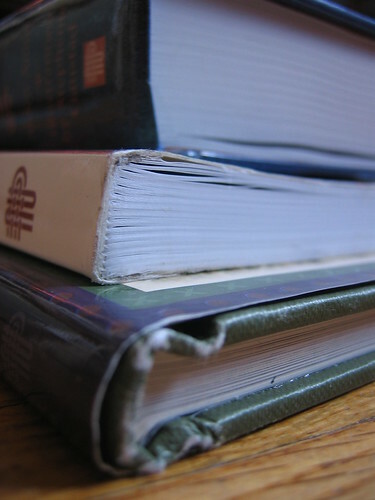 Like last year, I can't tell what makes these books "hurt." There's a little wear on the bottoms, but really not a big deal. I have NO LUCK with that sale. Argh. No expert here, but I'd say your book is Latvian, not Russian. Riga is the capital of Latvia. Remember last year there was all the fuss about the NATO meeting in Riga and they all got Latvian mittens? I'd love to try Latvian mittens sometime. That will be a ways away, though. But you never know! 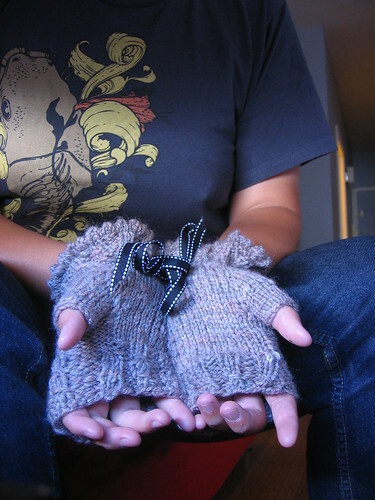 Those mitts are soo pretty!!! Lucky you with the book score! Those mittens are too cute! 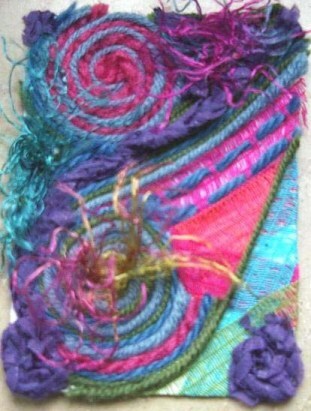 What a great idea for a little bit of handspun. I forget all the lovely little projects you can do with it. 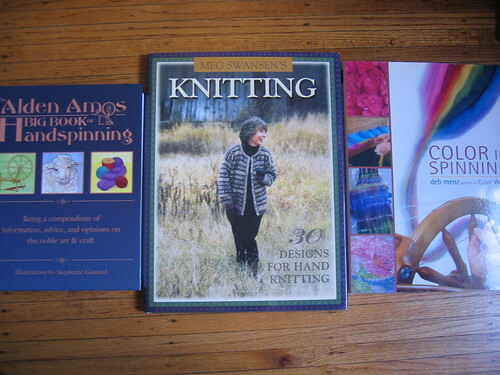 I really need to knit something with my 2 hanks I've spun. 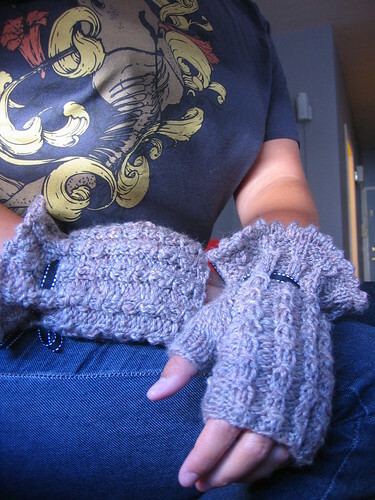 Nice fingerless mitts! 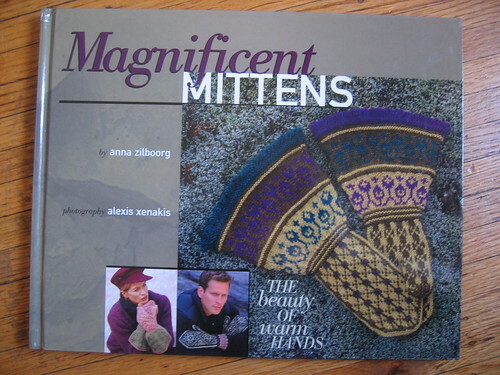 And I love the mitten book. I bought one last year. btw, love the title of your post. Love those mittens, especially the ribbons.